Coach Hamilton’s Call-In Show is an hour-long broadcast beginning at 7:00 p.m. 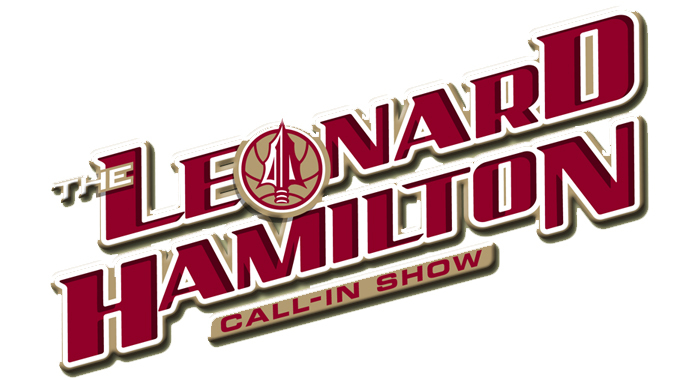 The show features Leonard Hamilton and Gene Deckerhoff talking directly with fans from across the country, touching on game insights, trivia and random Seminole banter. Fans can ask Coach Hamilton questions and take part in interactive trivia games and contest that will test your Seminole basketball knowledge. Members of the live audience will have the opportunity to win great prizes, including tickets, autographed memorabilia and more. From Miami to Pensacola and all points in between the Seminole IMG Sports Network is the broadcast radio home of Florida State basketball. The show can be heard in Tallahassee on 99.9 HANK FM. Listeners call find the show streamed on Seminoles.com. IMG College is the multi-media partner of Florida State athletics and holds rights to radio broadcasts of all Florida State athletics along with television and radio broadcast rights to coaches’ shows in those sports. The home of the Leonard Hamilton Call-In Show is Madison Social located in College Town in Tallahassee which is the perfect place near campus to gather, enjoy great food and listen to Hamilton and Deckerhoff talk about everything that is good about the Seminoles. January 19, 2017	 Thursday 7:00 p.m.